Managing your time, although not always easy, is extremely important in order to stay productive and live a fulfilling life. Between managing your work schedule, personal life, working out, and even a diet schedule, there are numerous things that need to be maintained. 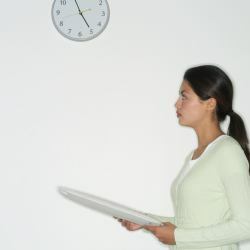 Here are five tips to proper time management. In order to properly manage your time, you need to first start by looking at where you are wasting time the most. Do you find yourself jumping on Facebook for hours? Are you reeled in by reality TV and all of the other shows that flood the networks? As soon as you have identified what is wasting away your life, you will be able to take a step toward better managing your time. The next step to proper time management is creating goals to follow. Goal setting is essential to move forward as it will give you something to strive for and stay focused on. It is important you set short-term and long-term goals that are both challenging and reasonable. Setting goals that are too easy will get you nowhere while too challenging will only set you up for failure. While setting goals is crucial, it is nothing without a plan. The whole intention is to change your behavior and get you to a point where you are making better use of time. Tracking your goals and having a plan for how you will attack the problems will help with the overall process. While it will certainly not be a walk in the park, it is manageable with a plan. Time management tools are your best friend as they can keep you organized and help you stay on track. Things like day-timers or some kind of software program will go a long way with the process. Software like Outlook allows you to easily schedule events, set up reminders, and easily track what is going on from day to day. No matter how good you become over time, no one is capable of accomplishing everything in one day. For this reason, the final tip for proper time management is learning how to prioritize. You need to learn how to put in order of importance various tasks so that you can complete the most crucial tasks today and push less important tasks off until tomorrow. This will save you a great deal of stress over trying to complete everything all at once.